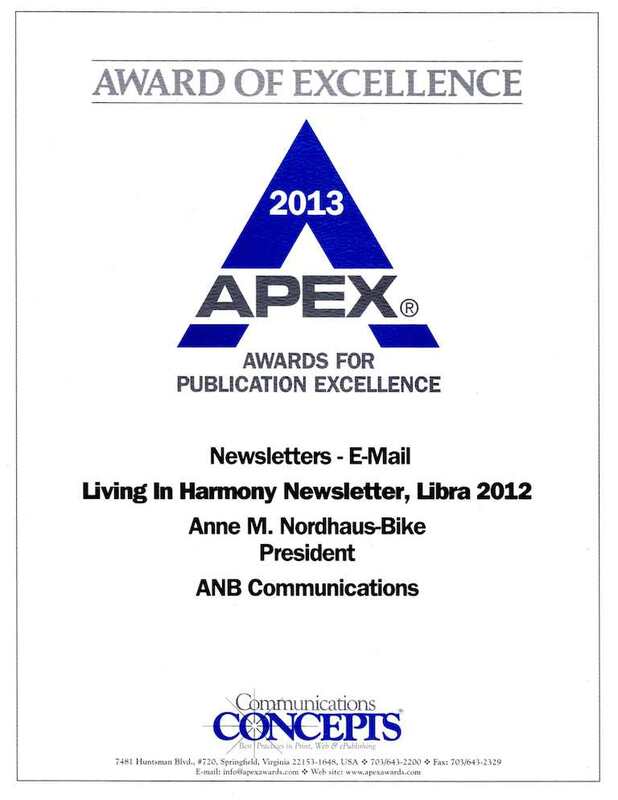 Anne ‘s Living in Harmony newsletter has won an Award of Excellence from Communications Concepts in the Newsletters-Email category in the organization’s Apex 2013 competition. 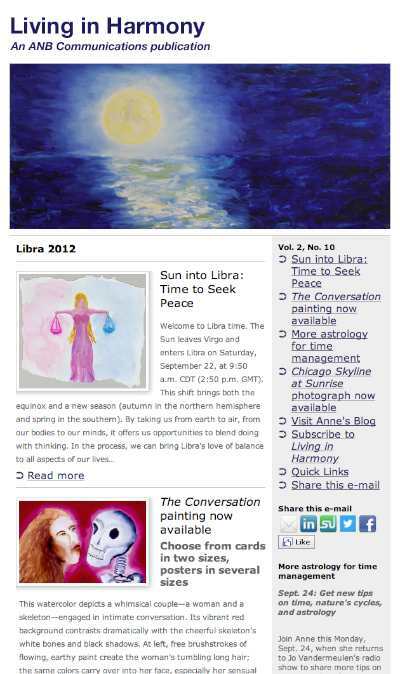 The publication was honored for the September-October 2012 edition, which covered the Libra time of year. “Being a Libra myself, it’s particularly gratifying that our Libra 2012 edition of the Living in Harmony newsletter received a prestigious Award of Excellence in this international competition,” Anne said. Communications Concepts is a journalism and communications think tank based outside Washington, DC, in Springfield, VA. This year’s Apex competition was the 25th annual. The recipient of eight journalism awards since 1996, Anne won an Apex Award in 2008 for her astrological column in the Gazette newspaper of Chicago and won another Apex Award in 2012 for her ANB Communications website. The international Apex 2013 awards competition featured winners from Canada, India, Singapore, South Africa, the United Kingdom, and the United States. Awardees came from well known companies and institutions such as American Airlines, the American Bar Association, American University, the Carnegie Endowment for International Peace, Dow Jones, Ernst & Young LLP, Ford Motor Co., and the Walt Disney Co.
For more information on Apex and Communications Concepts, visit the organization’s website at www.apexawards.com. To see our press releases about this latest Apex Award, visit the ANB Communications pages at ExpertClick and PRLog. To sign up to receive the Living in Harmony newsletter, visit our Subscriptions and Archives page. While there, be sure to browse the archived issues and check out the newsletter for your Sun sign to learn more about your personal astrology.